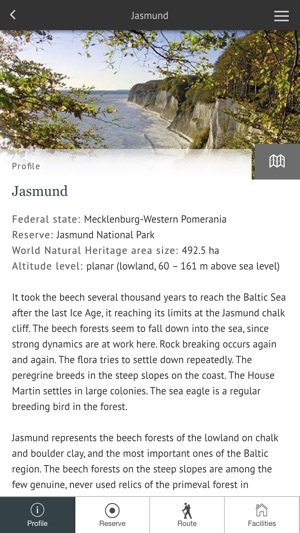 The smartphone equipped with the World Natural Heritage App will be a reliable guide through the European wilderness and will provide you with information in German and English. 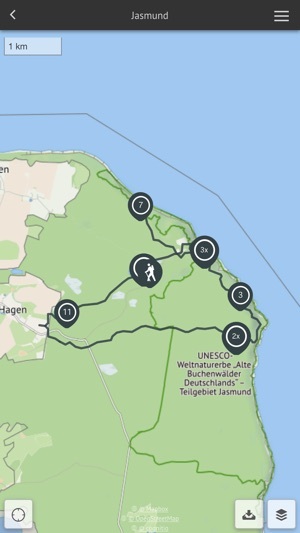 The App invites people around the world to explore the World Natural Heritage on eventful paths through the forest. 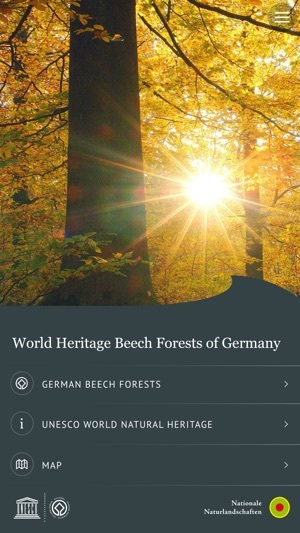 One special route will be offered for every area of the Ancient German Beech Forests, including explanations of the particularities of the beech forest landscape. Maps and services especially tailored to the respective location enable you to familiarise yourself with the sites in details. 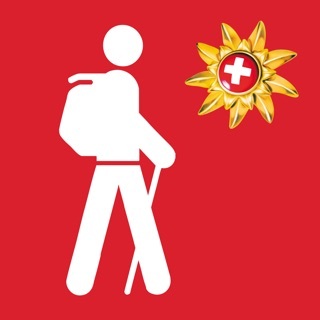 For a perfect hiking experience we recommend you to download the app and map sections already at home or at the hotel. The availability of the Internet may be restricted in the protected areas. People were fascinated and inspired by the Seven Wonders of the World in ancient times. Today, we are fascinated by the unique and irreplaceable natural phenomena and cultural assets of the UNESCO World Heritage. The World Heritage Convention is based on the idea of preserving these sites as heritage of humankind. 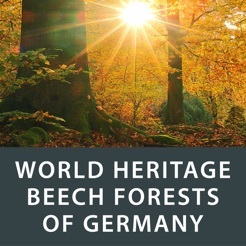 “Primeval beech forests of the Carpathians and Ancient German Beech Forests” is the European World Heritage site which is on the World Heritage list and reflects the continuous development of the unspoiled forests in Europe. It is the beech forests in Europe which present a process that is unique in the world. A single tree species – the copper beech – dominates the ongoing forest evolution in extensive parts of an entire continent. Apart from a few remnants, pristine forest landscapes, however, disappeared. Therefore, the World Natural Heritage site “Primeval beech forests of the Carpathians and Ancient German Beech Forests” comprises the last primeval forests of the Carpathians which have been able to develop without human influence since the end of the last Ice Age, and where bison, elk, wolf and bear roam. 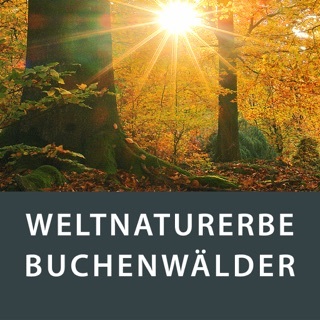 These are completed by five German forest areas which are on their way to a new wilderness and tell about the expansion and diversity of the beech forests of Central Europe. The European wilderness invites you to go on a fascinating journey. The infinite coastal dynamics in Jasmund promise unforgettable impressions, which already inspired famous poets and painters. The beech forests seem to plunge from the chalk cliffs into the sea. These pictures symbolise the continuous expansion process of the beech. The beech forests in Serrahn lead you into past glacial times. In poor sandy locations they lean far across the moors from the glacial period. Beech forests persistently approach moors and are also reflected in glistening lakes in Grumsin. Unforgettable colourful pictures are created in the course of the seasons by the close relationship of forest and water. In spring it is a sea of blossoms which characterises the beech forests of the lower mountain ranges with the largest number of species in the Hainich and tantalises the senses. 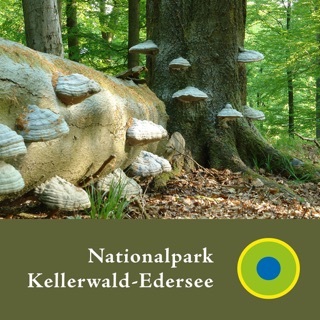 Take a dive into the sea of beeches, is the motto in the Kellerwald where quaint beech forests crouch on meagre slopes and where a green canopy stretches between the horizons. 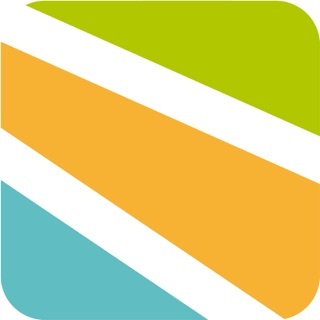 Thank you for using our app! We regularly provide updates to the App Store to further improve our app.